The Metro service in Toulouse has been set up to serve this French city along with some of the neighbouring suburban areas. The network comprises two metro lines that are predominantly underground. Lines A and B, operating over a combined route length of twenty-eight kilometers, features as many as thirty-eight stations. 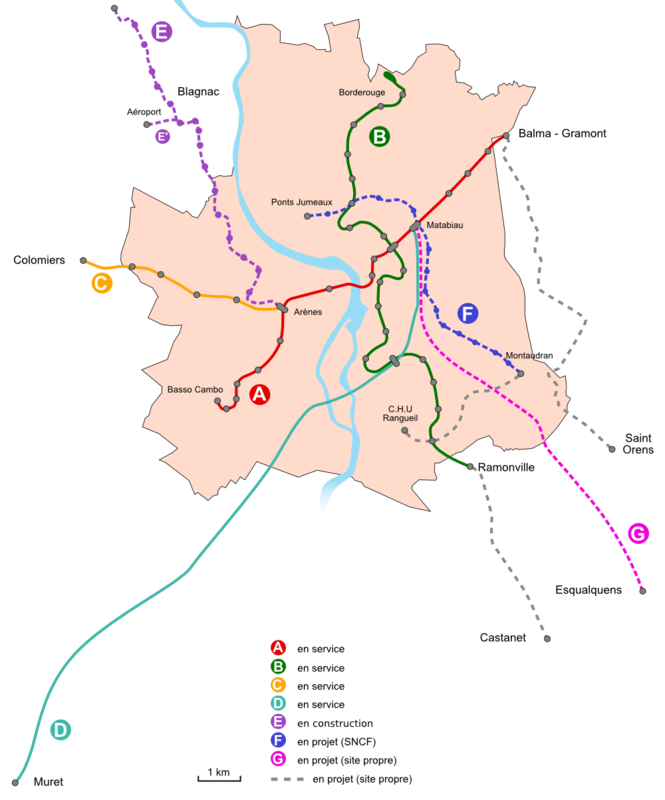 In order to supplement the Toulouse Metro rail service, there are suburban railway lines- Lines C and D- that respectively run towards the western end of Toulouse and the suburb of Muret. There is also an old tramway line, T1, that connects the suburb of Blagnac to the city Metro service. Toulouse Metro has a daily ridership of 281000 as in 2011. Toulouse Metro Line 1 at present comprises eighteen stations spread over a route that stretches over twelve kilometers in length. The main section of this route began operations in the month of June in 1993 while an extended service upto Balma-Gramont from Jolimont was opened in the year 2002. This extended service starts from the Balma shopping center and runs through Toulouse with the main stations being the ones at University of Mirail, Place Esquirol, Capitol and Marengo. Plans are in place to extend the service further north by as much as five kilometers upto L’Union. However, the project is still in the planning stage and even if finalised, it won’t be completed before 2030. The initial phase of Line 2 has been designed over a length of sixteen kilometers and features twenty stations along the way. The service commenced operations back in the month of June in 2007. Apart from car parks at the important stations, it also offers bus connectivity to the important locations around Toulouse. A southern extension of this line has been planned along a five kilometer stretch running over a viaduct. It is expected to be completed by the year 2019. Operation hours are from 5.05 am to 12.42 am. One way ticket fare is 1.60 Euros. Return ticket is 2.90 Euros. Its economical to buy 10 tickets for 12.70 Euros. Map of Toulouse Metro showing various lines and stations. Click on the map to enlarge it or Download Toulouse Metro Map in PDF.